Math Vocabulary Cards, by the Math Learning Center | Clarity Innovations, Inc. Math Vocabulary Cards help students deepen their conceptual understanding of key terms in mathematics. Each card features three sections: a math term, a representative example or model, and a concise definition. Each section can be hidden or revealed providing multiple options for practice. Vocabulary cards can be selected individually or by category and switched seamlessly between English and Spanish. Math Vocabulary Cards are ideal for elementary classrooms and other learning environments that use iPads. 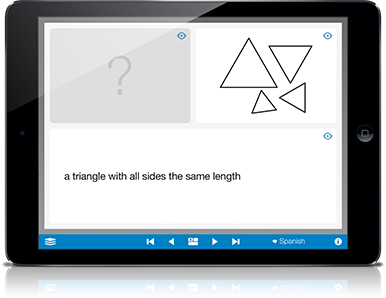 For more information about Math Vocabulary Cards and other apps, visit: www.mathlearningcenter.org/apps.